LETTER | Over the last couple of weeks, the government had echoed its stand on the most talked about East Coast Rail Link (ECRL) project. Now, it looks like the ECRL will be finally be given the go-ahead with adjustments to the pricing and scope of works. To recap, the ECRL project was pushed ahead at lightning speed so much so the agreement was not analysed in detail to check if this project truly brings a good return for the country, its people and the local rail industry. During the initial phase, there were some initiatives to provide some scope of works to local contractors. However, these were not much to be talked about. It certainly would not create an impact on the development of the local rail industry. Though this project is financed by a foreign country and its entity, nevertheless one must remember that finally, the amount will be paid by the government of Malaysia. In this aspect, as the client, the government must see to it that this project rightly benefits the country and the local rail industry. SamuelLuke Good la like sound better!!! Buy a definitely buy u guys go check how many land property MRCB has even the NTA has to be revalue due to the revival of ecrl & HSR the revalue NTA could be 1.3 !!! Sinoboy 4pm now, any movie on? Bursalord Sickening, temporary move to gkent. One of the potential fast moving ecrl related counter. Chewing Gum Tomorrow up or down r??? Desmond Nah any source link? Very fast will break 1 ringgit. Wct is my second time sapu and same profit money as last time . Why too many value asset and shopping mall is running good . Desmond Nah ha signed and still nothing happen. SamuelLuke Shortsighted ppl always sell early, those who say buy on rumors, sell on news only applicable to other sectors not constructions & “property” sector like MRCB. MRCB current NTA sit on 1.1, it should have rooms to grow!!! Do more study n wish it should go back to .9, even so ... i will buy more!! Luckystock Buy more!!!. Anything less than 1.00 ringgit. SamuelLuke Haiz I hv done my best.... let y’all have it. It was a good play good money after all from .7 till now. Till next guys!! SamuelLuke Superbull11... wah famous guy picking on me, the next joetay award will belong to you this year u can keep doing tht.... clap clap clap!! Guys u know what to do, I gave all my hints n thts it, buy sell u like muacks huat ah!! "The new alignment will leverage on the existing KLIA Express Rail Link (ERL) as well as the future MRT2 SSP Line with an interchange in Putrajaya Sentral. SamuelLuke Yie, no force selling eh when it will go down .9 ??? Buy more buy more 1++ in the making !! Found a construction stock with low PE, Good NTA and div soon. The company revenue YoY also consistent improve from last 8 quarter. SamuelLuke B ya?? Yup tht should be the letter of the yr. once took the ‘biagra’ construction sector will go up for sure !!! Everyone benefitted!! Chewing Gum Biggest and largest project being approved, MRCB as the key property and infrastructure player who backboned by government (sugar daddy) will sure darling them with full of cash. SHQuah Bandar Malaysia. MRCB is waiting for you. 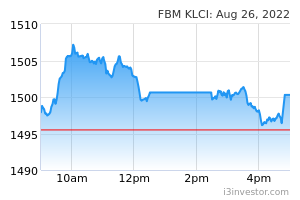 Luckystock Less than ringgit 1.00 is a buy for this stock. A lots of potential to move higher. Many good news forthcoming for this counter. Buy buy buy!! !